Read 2 times. Last read May 18, 2013 to May 22, 2013. There’s no better place to start than the beginning where the heart is hurt among family. In Hayworth Kansas we meet Eric Wellborn an outcast whose prophecy only can result in death. He’s an heir, he’s intelligent, and he’s a powerful Shade but he’s damaged from losing some of the most important people to him then you add the big battle he has to fight in – if he lives that long. Eric then finds himself in a dangerous situation when the new girl Jessica arrives into town. A character that’s just as lost, damaged & in need of answers as Eric is. Shannon has created two main characters Jessica & Eric who complement each other as you will see when you read from each perspective. She gives us different insights as we read on without making it difficult to follow. I completely loved the flip from each character. It added great detail to the story. The transition of different perspectives gave the story the ability to move along without too many bumps in the road. As we read on you learn about the dark & the light very quickly as Eric explains their history as far as he knows it & his prophecy. We find out why they the Shade’s & the Lights no longer work together & why they are out to kill each other. When we get back to Eric we find out he’s a powerful shade & among his abilities is to sense people, something he uses to find Camille a half breed & his guardian but instead he finds another shade. She doesn’t know what she is or what to do with herself. He keeps this a secret but it continues to nag at him – who is this girl he found & why was she somewhere she wasn’t supposed to be? Of course she’s an important figure in the book but Shannon’s twist with this character was well done. I found myself hoping for the best. A part of the book I really liked was the naming ceremony that is held when kids turn of age to receive their powers. A big part of the Shade’s history. The ceremony is not all it’s shown to be with glitter and crowns. Eric shares his thoughts while watching it all unfold & he makes note that what was in store for the future was far from something to celebrate. They had responsibilities and a lot of pressure comes with that. Why do I think something as simple as their naming ceremonies are important? It’s a reminder of innocence. Eric talks about how happy the children are running around, testing their powers & there’s this sense of invincibility. It’s a coming of age for these kids. It’s like when we graduate that final year of elementary school and we’re heading into high school that coming fall. We’re excited, we’re scared but most of all after that ceremony, after the summer ends it’s a new journey we’re taking. Sometimes we feel invincible and we are trying to figure out who we are & most of all we’re trying to find where we belong. Exactly like the naming ceremony. Shannon gives us detailed descriptions of the scenery, the homes they live in and what they look like which I enjoyed. I appreciate that Shannon reminded us of what the characters looked like throughout the novel because with so many characters coming in and out it can be hard to keep track sometimes. I like that I was able to picture the story in my mind and see what Shannon created. I very much like visuals because it helps me as a reader connect to something. Shannon’s ability to reveal answers that many authors often leave till the end is a great strength. I think it was also a risk that paid off. We know so much about the characters, the history and the future before we’re even half way in. Shannon touches on everything readers want and gives the illusion that the knowledge we’ve given is all we need. It’s far from that though – there’s a rich, capturing story following and don’t for one second assume you have all the answers. As we read on I notice many changes from the characters Shade forms & their human counterparts. For instance, because they cannot reveal their human form to others it makes the relationship between Eric & Jessica interesting. They don’t see eye to eye in their human forms, Jessica can hardly get Eric to speak to her let alone be around her. While in their Shade forms these two are very much glued to one another. I like the parallel that Shannon adds to the story by doing this because she explores how we act around others in different situations. I truly got a good laugh at the differences Jessica & Eric have in their different forms when I read the book. I mean – we know who they are but they don’t so it gives us as the readers some humor to see how they treat each other because of this. It’s great to see how Jessica & Eric need each other but at the same time that them being together could be the death of them and result in the great battle heading a completely different direction. Here’s another example of what makes this book so good. There’s the relationship Eric shares with his step-mother & step-brother, which I find very human considering Eric isn’t. I think a lot of people whose families have come to have step’s feel the same way Eric does at the beginning but it’s refreshing to see how he grows with this relationship. You get to see clearly how he feels, how he deals with it and Shannon even touches on how they feel or at least the adorably-annoying step brother. Then there’s the relationship Eric shares with his guardian, Camille. I find that she is a wonderful addition to Eric. I like how she cares so much for him but at the same time Shannon shows that she too struggles with her own past and future. She’s just as lost and hopeful as everyone else in the story. Shannon’s progress with the character development was brilliant. I feel she permitted the characters in Minutes before Sunset to shift in their personalities & grow with each other from being who they were at the start to who they started to become at the end. The progress was smooth & it felt completely right as you read. The reason why I am fond that the characters didn’t go from black to white? Well it’s because the grey areas of people are the best parts – its messy, its trouble and it’s beautiful. I truly do look forward to the sequels to see how this story will progress. It’s engaging, believable and with each chapter you find yourself rooting for the characters and praying they make it out alive. I am intrigued to see how it all will end. The only thing I wanted more of was more of the stories with the minor characters; I was curious to the subplots in this story and wanted to see how they would progress. I however believe Shannon will explore them more in the rest of the series considering how Minutes before sunset ended. How did it end? You’ll have to read it to find out why you need to read the sequels! It was a nice twist. Shannon really impressed me with the way each relationship is diverse. Shannon’s writing style provides her readers the ability to connect with the characters. She creates an unique world that causes us to question everything and even while she gives us answers every few pages we’re still left with wonder. 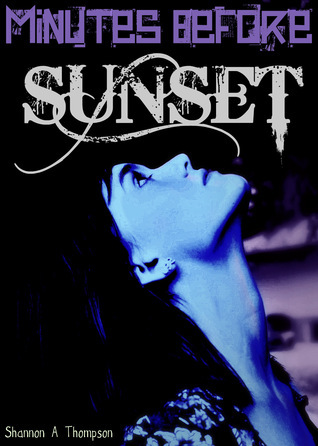 Take your time when you read Minutes before Sunset so you can enjoy what Shannon adds all the way through. Shannon is able to capture simplicity in a potent way. She puts all her heart into her work and continues to give her readers only the best. I had a hard time putting away the book as I wanted to know what would happen next! There’s so much depth in each page – you need to see it rather than just read it. Shannon Thompson delivers a story that will have you begging for more! Bravo Shannon Thompson! I wish you luck on your journey and hope you only continue to receive the recognition you deserve because you’re truly a gem! Sign into Goodreads to see if any of your friends have read Minutes Before Sunset.